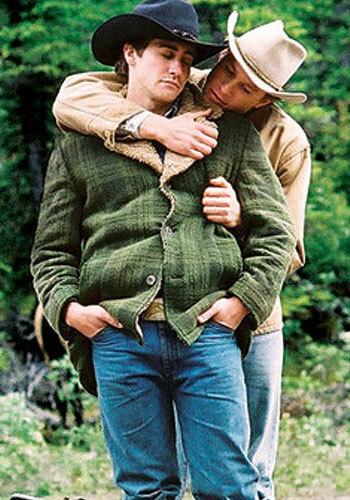 Jack and Ennis. . Wallpaper and background images in the Romantic Movie Moments club tagged: romantic jack ennis heath ledger jake gyllenhaal brokeback mountain. This Romantic Movie Moments photo contains 船工, 里窝那, 巴拿马帽子, 水手, 撇油器, 草帽, 船头, leghorn, 巴拿马, 巴拿马草帽, 撇乳器, 撇渣器, 捕捉帽檐帽子, snap brim hat, 管理单元边帽, 软呢帽, 毡帽, 斯泰森, fedora, homburg, trilby, 洪堡, and 斯泰森帽. There might also be 宽边帽, 阔边帽, 礼服帽, 帽子很高, 歌剧帽, 礼帽, 瘦腿, 顶帽, 海狸, 礼服帽子, 高帽子, 歌剧帽子, 丝绸帽子, 炉子, 高顶礼帽, 轻便短大衣, 高顶帽子, 髓帽子, 头盔髓, 太阳帽, topee, 托皮, 披肩帽子, 披肩头盔, 太阳头盔, topi, 髓帽, 试纸, and 遮阳帽.